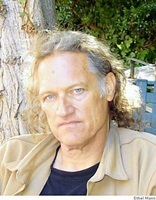 Poet and translator Jim Powell lives in the Bay Area of California. He is a fourth-generation Californian, and his work investigates politics, history, and material culture, often drawing on years of research. Of his second book, Substrate (2009), which includes sections on California history as well as evocations of the natural world and piercing satire, Powell noted, “I was interested in using the lens of poetry and verse to focus that witness down. I was looking for places where you could, like, set up a film camera and have a point of view from which you could bring someone's witness into the poem with a sense of them as witness." Substrate was published 20 years after Powell’s first collection, It Was Fever That Made the World (1989). He has also published translations of Catullus and Sappho. His honors and awards include the CCLM Younger Poets Prize and a MacArthur Fellowship. In 2005, he was the Sherry Poet in Residence at the University of Chicago.